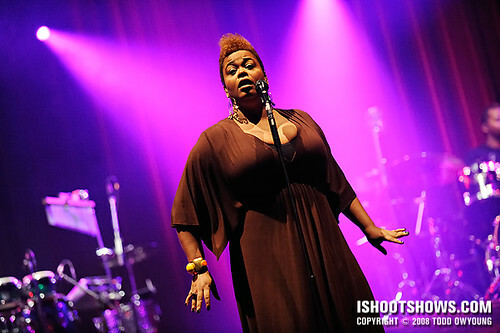 Jill Scott didn't bring her three Grammies, but you could hear every one of them in the electrifying performance the virtuoso singer delivered at the Fabulous Fox Theatre. 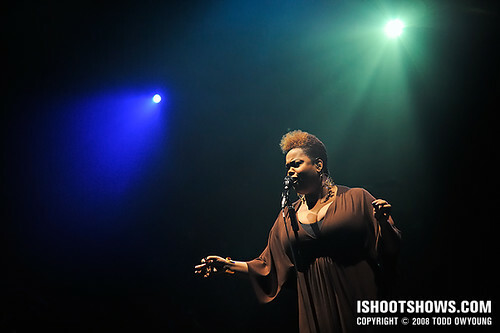 Scott treated the sold-out crowd of 4200 to a rich set list, starting off with “Let It Be” from her 2007 release, The Real Thing: Words and Sounds Vol. 3, followed by that album's title track. 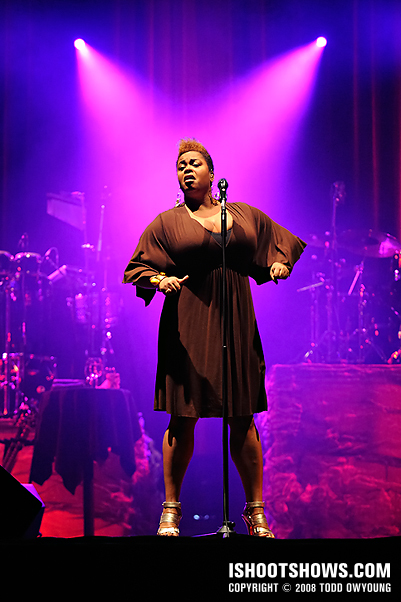 After her performance of “The Real Thing,” Scott paused between songs to reiterate the song's second verse for the uninitiated. By the end of the night, there was no doubt about the veracity of these lyrics. Fact: the woman's got pipes. 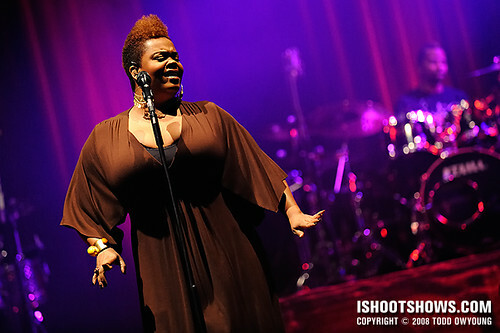 Just as with shooting Raheem DeVaughn‘s opening performance, photographing Jill Scott's set proved an interesting challenge given the setup of the Fox Theatre. Without a dedicated security/photo pit, I shot crouching down in the aisles of the venue and generally tried to stay as out of the way as possible. This approach, combined with the layout, restricted composition to a degree, but the spectacular production won out in the end. I shoot for the first two songs, and was glad that I brought my casual kicks instead of my dress shoes. While the latter would have been perfectly at home in the posh theatre and among the well-dressed crowd, flexible and comfortable shoes were an absolute must for this gig. 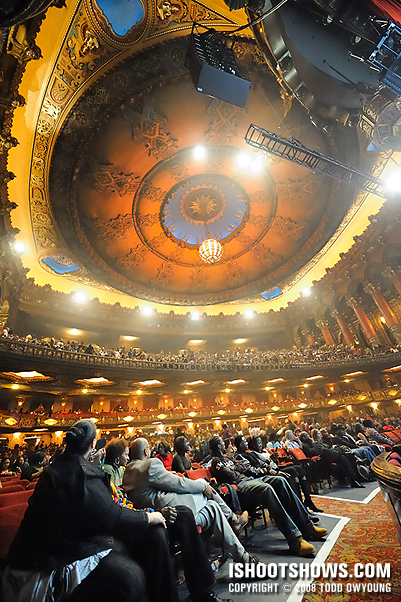 Unlike the high stage of the Pageant, the Fox Theatre's stage is only about four feet, which would have made standing all too conspicuous. 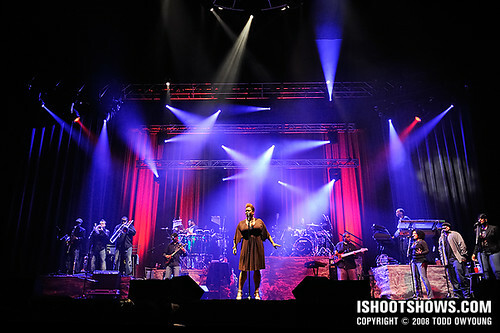 The production opened with a loose grid of shifting lights behind Scott, which created a fantastic backdrop of color and texture with the surprising amount of smoke being generated on stage. During the first song, this curtain of lights rose to reveal the full band and backup singers, along with a variety of more environmental lights. During the first and second songs, this mix included reds, greens, yellows, purples, and blues. Light on Scott herself was warm, thin light from high above – no such luck with a spotlight for the first two. While the front lighting was weak, there was generally more than enough action in the background to keep things interesting. Since much of the lighting occurred at the back of the stage, I shot primarily from fairly acute angles to keep the background as lively as possible. Shooting from the sides produced the best mic separation, but simply didn't do justice to the lighting production. Since the light on Scott was relatively constant, I shot within a fairly narrow range – around f/3.2 and 1/250 at ISO 2500, give or take a third-stop in any direction. 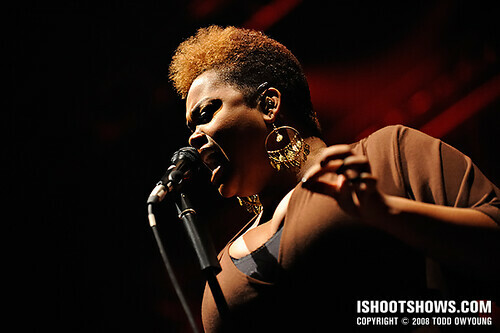 I shot with the Nikon D3 and Nikon 70-200mm f/2.8 for almost the entire set. Given the moderate distance from the performer, the range of the telephoto was most welcome. I did switch to the Nikon 24-70mm f/2.8 for just one shot of the full stage, knowing I'd be remiss if I missed capturing the full setup. 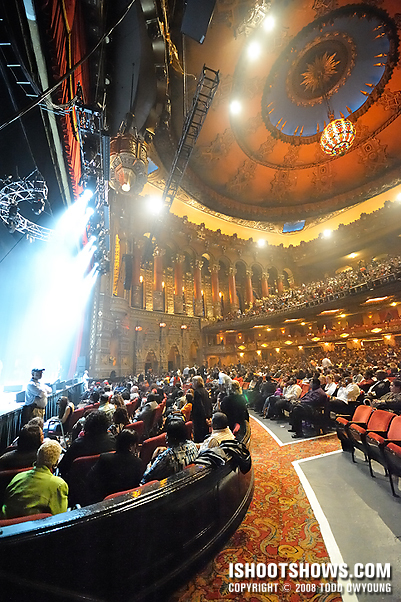 Below are two snaps of the Fabulous Fox Theatre itself, in between sets. 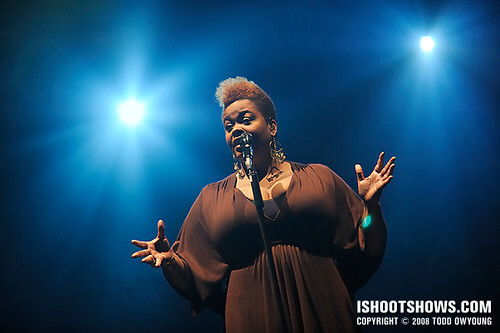 You can see that despite the size of the venue, there is actually a good deal of haze in the place, which was put to good use during Jill Scott's performance. The Fox is a wonderful venue. Hey Raquita. Maybe after Jill wins her fourth Grammy, she’ll be back. Next time! Thanks, Janet. It was a great performance and one I was really looking forward to. And of course, it’s always a treat to shoot at a place like the Fox. Hey Solange, you’re too kind. Thanks for the thoughts on this set. Crouching down wasn’t ideal, but it worked out well enough. I basically had three main access points to the stage in the form of the three aisles that met the front of the stage. I appreciate the comments – if any of these shots are inspiring, that’s one of the biggest compliments I can be given. Thank you! This set is just so beautiful. Shooting crowching down restricted your composition? haha!! what it would be if it didn’t? They are just stunning. 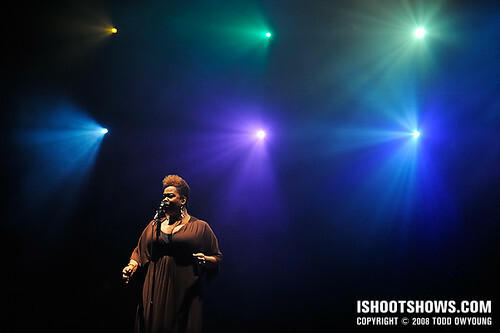 I do love looking into my live music photos around the net. I like many but yours never fail to impress me. I am not good at it but I do know what a great shot is. Once again a great batch of photos! But where did you find the flickr plugin for your galleries? Todd! This is an excellent set! The venue looks wicked. Glad you chose your sneakers instead. Must be difficult moving around to get those shots in such a short time. Hey Aloysius, thanks! The “Fabulous Fox” is a fantastic venue with great details. It would be really nice to photograph the place just as an architectural/interior project. Sneakers were a must. I do love my Vasques. Thanks, G! Thanks for stopping by, glad to hear you enjoyed this set. The wide angle shot of the theatre is phenomenal. You are a true master. Thanks, Ajay. I knew I had to try to shoot the theatre interior. Even 14mm on a full frame sensor wasn’t enough to truly capture the space from where I was at the side of the stage. I’d love to shoot from the stage, I think that vantage point could make a killer shot. This set is just incredible. You never cease to inspire me to keep at it. Thanks for stopping by, Patti. I appreciate the comment, glad you enjoyed the set. Cheers. Interested in purchasing some of your pictures of jill. Is it possible? Kisha: Please send me an e-mail – thanks! 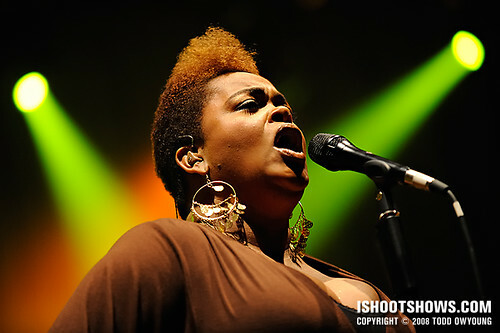 You really captured the essence of Jill Scott. 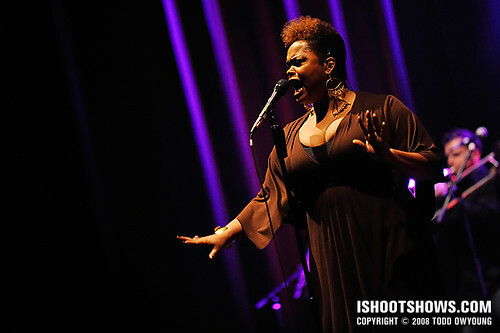 Awesome angles and I love the full shot of her with her fist clinched, shoulders square and singing strong. You should talk to Jill & Hidden Beach about putting these shots on posters, T-Shirts, Leather Bomber jackets, pillow cases and sheets for sale to the public. She is so hot…they would sale like wildfire. My two cents..GREAT JOB!!! Hey Wanye, thanks very much for your comment. 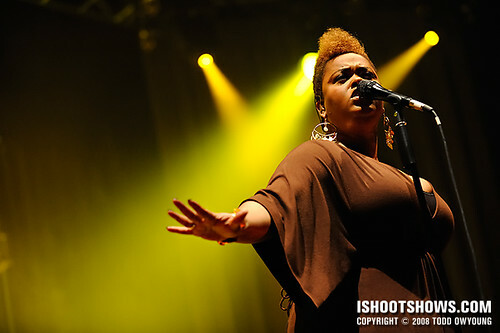 Hearing that these images show the essence of Jill Scott, especially from a fan, means a lot. I appreciate it. i like many of the commenters above me on this post, really enjoy your work. the crispness in your photos is awesome. 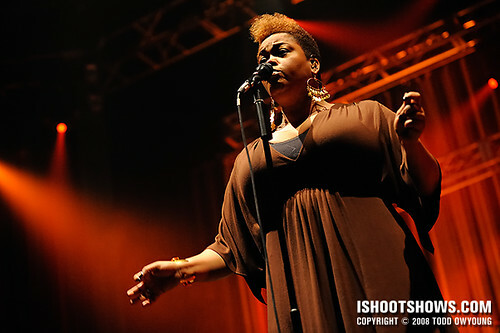 The Roots and Erykah Badu will be at the Fox in Atlanta next month, any idea of who would be a good contact to get access to cover it? And thanks for sharing your knowledge on this page. Peace. 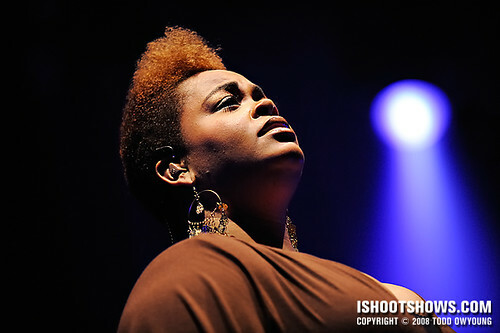 As I recall, the Roots are really a tricky group to find PR info for – I know I looked a few years ago without success. But in general, Google is a great way to start in looking for contact info. Most of the time, the info is out there, it just requires a little digging. And if that fails, a phone call to the label can go a long way. Also, you can try contacting the venue’s booking agent/promoter about the event. They should also have the proper PR contact. Deandre, this show was at the Fox Theatre in St. Louis. I think there are at least a dozen “Fox Theatre” venues around the country, so it’s certainly confusing.